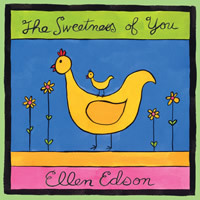 – Freeclyde Music, a new independent record label, officially launches with a new release by Ellen Edson, entitled The Sweetness of You. The album is a collection of lullabies, songs of love for things like birds, trees and family. The Sweetness of You features 16 tracks, including several original pieces penned by Edson, who sings and plays banjo, guitar, dulcimer, mandolin and autoharp on the recording. The album envelops the listener in a loving spirit, perfect for comforting, settling, and soothing children and adults alike. A native of Los Angeles, Ellen grew up in a musical family with influences of classical, folk and film music. When she was about 9 years old, folk music became her passion, when her mom brought home a recording by Pete Seeger. Learning first the guitar, then the banjo, she became particularly enthralled with the mountain music of Appalachia. This led to learning both the autoharp and mountain dulcimer. Working with her father, the late film composer Jerry Goldsmith, Ellen played guitar and autoharp for his popular television theme for The Waltons, and for the film score of Wild Rovers. Collaboration with her brother Joel Goldsmith, also a film composer, produced the CD Family Fare, as well as contributing guitar, dulcimer and autoharp tracks to his score for the film Shilo 2.